Translated by Ramona Mitrica, Mike Phillips, and Mihai Risnoveanu. Andrei Mladin, the journalist protagonist of this enchanting novel, discovers the body of “uncle” Valentin in the library in his apartment. Terrified that he will be accused of killing the old man, he manages to carry the body seven floors down into the basement despite his eagle-eyed neighbour, Miss Margareta. He remembers the days before his terrible discovery: he has interviewed a famous violinist, Mihaela Comnoiu, and, much to his surprise, she has become romantically interested in him as a result. Mladin attended a party with Mihaela, but passed out, presumed drunk. He soon discovers that Valentin and Marian Sulcer, a handsome actor and love-rival, took him home in a taxi. But he can’t remember anything else. Most of the book is taken up with Mladin’s attempts to find out what is going on, trying to remain one step ahead of the police in the process. Although this plot is briskly told, the main delight of this book is its social context: it was written at a time when the ghastly Ceaușescus were in power and the state controlled everything. Arion’s book is a brilliantly ironic satire on this system. Somehow he managed to get the script past the authorities to publication; the result is a constantly funny narrative that never falls into the trap of taking itself too seriously or producing political polemic. The plot unfolds, accompanied by Mladin’s thoughts and sayings by his grandfather (all ending with “end quote” as a reference to the style of the Ceausescus’ pronouncements), all these small pieces forming a mosaic of this bizarrely horrible society – in which most people in this novel exist by being eccentric or behaving against type. The novel succeeds because it is determinedly light-hearted and irreverent. The crime plot is presented in the same style, so one does not feel that the characters themselves really gel as people, rather that they are present as means to an end. I found it very easy to guess the perpetrator without any clues, because of the allegorical nature of the book. Even so, this does not detract from the pleasure of reading it (and part of the solution was a surprise). 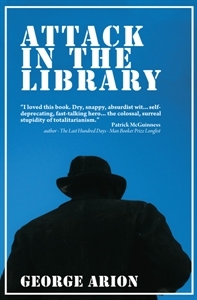 Attack in the Library can be read as a “straight” novel, but it comes with an excellent introduction by one of the translators, Mike Phillips, which describes both the political background to the book as well as the decisions he and his fellow-translators made while preparing the (footnoted) English-language version. Even the picture on the cover is explained. This introduction is available online. It would be marvellous if the publishers of other translated novels would take the lead provided here, and include an essay by the translator(s) as a routine part of foreign-language editions. I purchased the Kindle edition of this book. Attack in the Library at the publisher’s website, with various recommendations. Euro Crime blog post about this and other Romanian crime fiction published by Profusion. This entry was posted in Book review, E-book by Maxine. Bookmark the permalink. I’m not usually a fan of lighthearted crime novels but it is good that someone is translating Romanian fiction. I once read somewhere that comedy and crime (not necessarily together!) were basically the only options available to writers who wanted to get their works published in Eastern Europe during repressive regimes. Not sure if this is the case but allegory and illusion often feature in the books that I have read. I think that’s right, Sarah. I’m not keen on comedy crime either, but I think when it is for a purpose (eg as here) it can work quite well. I would not want to read too many books of it too close together, though. Maxine – It sounds as though Arion came up with a very clever idea to tell a good, fun crime novel and say something about society at the same time. That’s a challenge under the best of conditions and certainly one in the context in which Arion wrote this. And I especially admire translators who can convey the humour in a story. To me that’s one of the most difficult kinds of translating there is. Thanks, Margot, yes I think the translators had fun with this one. It’s quite erudite as well, quite a lot of the footnotes are like Sartarelli/Camilleri, ie explaining classical literature allusions and so on (not always necessary for all readers of course! I did know quite a few already;-) ). I loved the clever manner in which George Arion proposed a puzzle that encompassed more than a crime plot. Being familiar with a lot of the references, I was delighted to see how accurate and sensible the translation was. Thanks for the comment, Carmen. I agree – I was aware while reading the book that I was missing out in this regard, knowing only what I’d read in the papers and in Nature (where the Cescascus were mentioned a lot in the 1980s by the correspondent Vera Rich, because of Elena’s scientific pretensions). Have just bought this (I got it from Amazon.de in English, and the Kindle price was a relief for my rather stretched budget), so we’ll see. I know quite a lot about Romanian history, for various reasons, so it should be interesting. Good you could get it from Amazon de at the “special” price, Lauren. I think this book and the two others from Profusion are going to be cheap in e-form for a certain limited time.